Richard Gere quería que les hiciesen la pelota en las boutiques de Rodeo Drive, eran los 80. Pero si Pretty Woman se rodase en 2013 la historia sería diferente: Julia Roberts le pediría a Gere su clave de PayPal y haría las compras online, ahorrándose así la humillación por las dependientas y, seguramente, se ahorraría también bastante dinero. Good morning! I used to hate polka dots when I was a kid, but after watching Pretty Woman I somehow fell in love with them. And I have to admit I always wanted a dress like hers. Well, luckily, after many years, my search is over and here it is! Perfect for summer evening walks, I couldn't love it more! How do you feel about polka dots??? 26 No te olvides de comentar! / Leave a comment! Wow..I am so impressed...You rock this look! This dress really looks like the one from pretty woman. So beautiful. I love polka dots. Nos encanta la pamela, y el estampado del vestido es precioso!! Que preciosidad de vestidito. Me encanta. I lived your outfit... Specially that hat.. I was going to say that I wanted to get a hat like that for Sarah- because she's been wanting a floppy hat for a while now- but since you got it in Madrid I think that would be difficult! If you're only bloglovin' perhaps we can follow one another? Me encanta la pamela o sombrero, qué precioso, y me he reido mucho con la entrada de las dependientas jajaja, yo no soy de las que compra por internet, me gusta ir y probarme las cosas :) pero si hay verdaderos chollos , me apunto!!! Pero que guapaaa! amo el sombrero y tambien amo las compras Online. Yo ya casi todo lo que compro es por medio de Internet. This is such a lovely look! 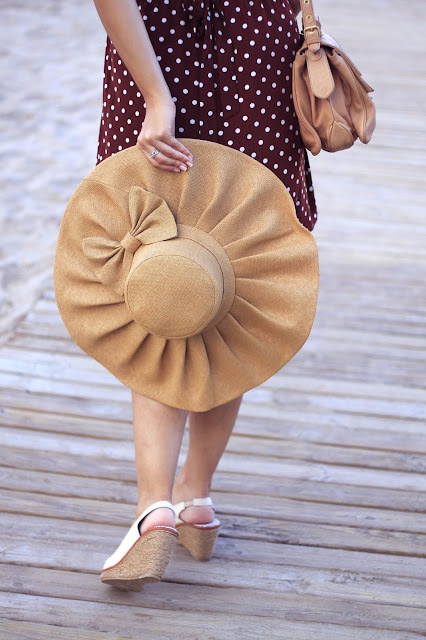 I adore the dress and that hat!